Cynical reporter Alessandra Russo heads to the UN hoping for a piece of the action, but soon becomes entangled in controversy and suspicion when ben Yusef singles her out for attention among all other reporters. As Alessandra begins digging into ben Yusef's past, she is already in more danger than she knows and when she is falsely accused of murder during her investigation, she is forced to flee New York. LINDA STASI is a celebrated media personality, columnist and critic for The New York Post. She is also an onscreen cohost of NY1, Time Warner's 24/7 news channel, and has appeared on such programs as The O'Reilly Factor, The Today Show, The View, Chris Matthews, CBS Morning Show, and Good Day New York. An award-winning columnist, she is also the author of five nonfiction books. 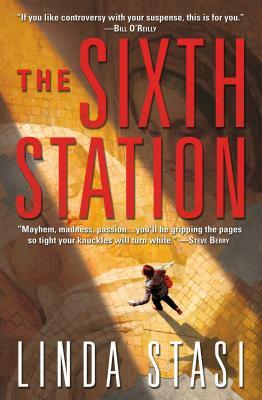 The Sixth Station is her first novel.